Pink Christmas Decorations are finding their way into homes across the country and around the world. Vintage pink Christmas decorations combined new styles has resulted in an updated version of a look that was very popular in the 1950’s. Do you have to go all pink? No, you do not. As much as we would all like to go all out with pink Christmas decorations, it isn’t always the best way to go. In fact, some family members may be less enthusiastic about pink Christmas decorations and want to stay with the more traditional red and greendecorations. In this case a compromise may be a good idea. Here is what you do...add little vignettes of pink Christmas decorations. For example if you have a piano top (not a grand where you are going to open the top while playing Christmas music) place your pink Christmas decorations there. Get a small pink or white tree add pink or white minilights, pink ornaments (balls, vintage and Victorian), strands of silver beads,pink bows, etc. you get the picture. Then place down some snow like covering and add all your other pink Christmas decorations and WHALLAH, you have the look! If you don’t have a piano top to work with you can use many other surfaces i.e. a mantle, a buffet, a window seat, a corner table, etc. Use your imagination. If your traditional Christmas decorations are in the family room you could always venture out into the living room with pink Christmas decorations. That is if you are not already decorating your living room! 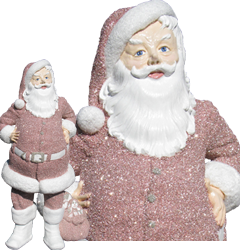 What is it about pink Christmas decorations? Some might say, “They are so pretty.’Well, why do we think they are so pretty? Let’s look at the meaning behind thecolor pink. According to SensationalColor.com, the color pink is associated with romance, pink is happiness and lightheartedness. And this one really rings true...for overworked and overburdened women pink may represent more carefreedays. Isn’t that so true. 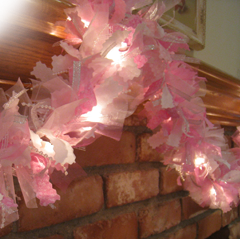 When we look at pink Christmas decorations our heart is lightened! If you have been holding back...go for it. Start adding in a little here and a little there. 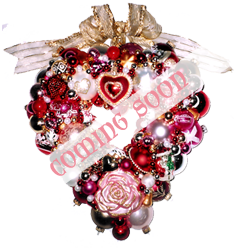 Enjoy the romantic and lighthearted feeling you will get when you look at your Pink Christmas Decorations!! !